PhyzLizp is an external application which can be used to measure and control events in Dax Phyz. PhyzLizp is a full-fledged, multi-threaded interpreter in its own right, making it ideal for creating Phyz extensions such as graphical interfaces, network gateways, non-linear constraints or games. 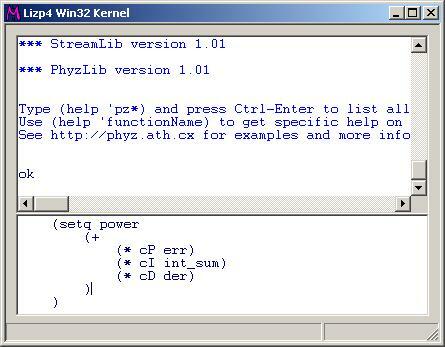 PhyzLizp is a programming language based on Lisp (Lizp 4), extended with Phyz specific functions. These functions all begin with the letters "Pz" and can be listed from within PhyzLizp with the command (help 'pz*). The source code of the Phyz specific functions, PhyzLib.lzp, is available for download. For Lizp 4 example code (not Phyz specific), download the source code for the official Lizp 4 libraries below. PhyzLizp is a single exe-file; no installation is required, and no files or registry settings are created or modified.